Through exploring the structure and history of the Israelites and their relationship with God according to the Bible, we identified the core building blocks that we believe are common in the make up of any community. Our concept is to bring to life this exploration and help people understand how to structure their own communities, through a fictional online interactive experience. Through this poetic expression in the form of an interactive website, users can click on the highlighted key words in the text to expand on the story of the Israelites, learn about the building blocks of the community of the Israelites, and use this website as an online tool and guide to write their own manifesto for their respective communities. There are 4 tabs to this interactive tool: Story, About, Write, Library. Within each of the first 3 tabs, there are two toggle-able views. As users click on the yellow highlighted keywords, the Israelite’s story expands, and the view of the text zooms out a bit more. The zooming out view of the story symbolizes the fact that, the more one takes action to participate in a community, the more one learns about what the community entails. And as a result (notice the slider on top), one goes from being an outsider (excluded) to being part of the community (included). The 9 building blocks of community, or community constants, are identified and explained in the context of the Israelites story. 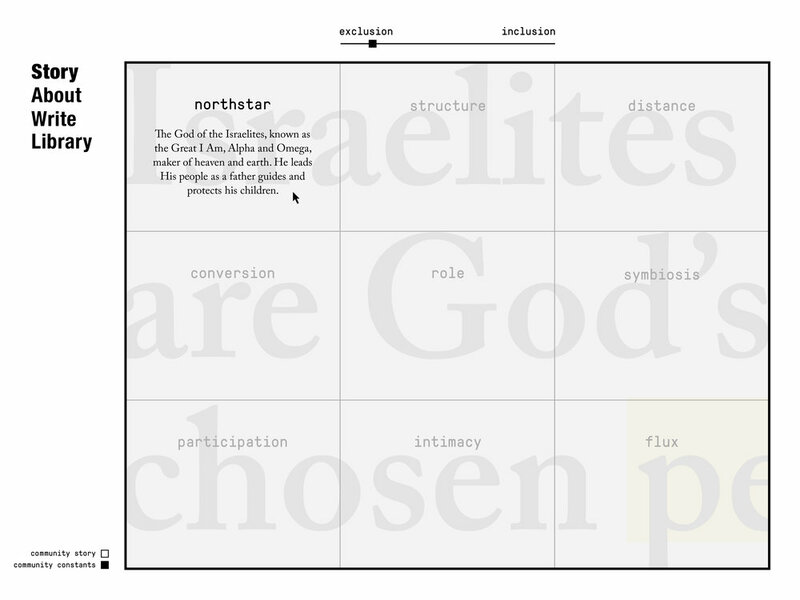 Users can hover over each grid to learn about how each community constant manifests itself in the Israelites community. The goal of this interactive online experience, in our own writing. We analyzed the Israelites’ community based on the timeline from Abraham’s time to after the birth, death and resurrection of Jesus Christ. 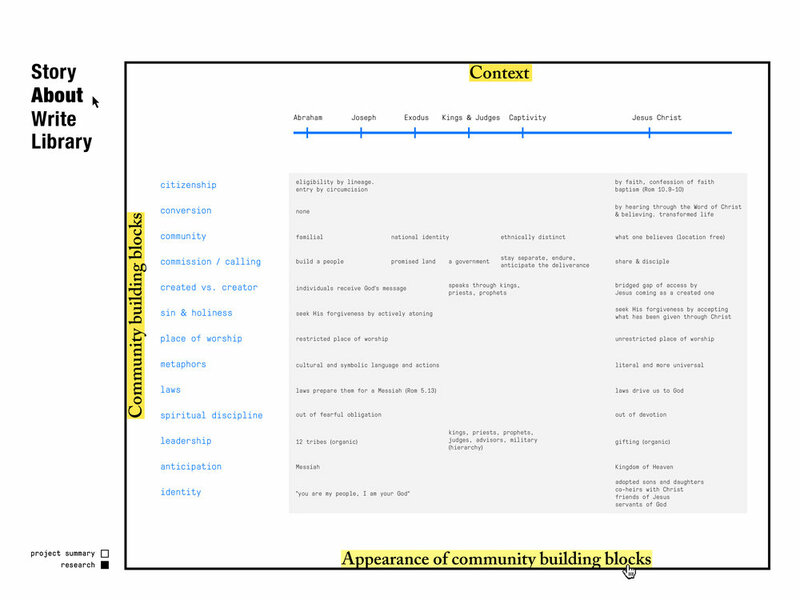 We extracted the community building blocks and sought to understand the appearance, or the expression, of these building blocks under different contexts. As users hover over each of the titles highlighted in yellow, the respective sections will also be highlighted. 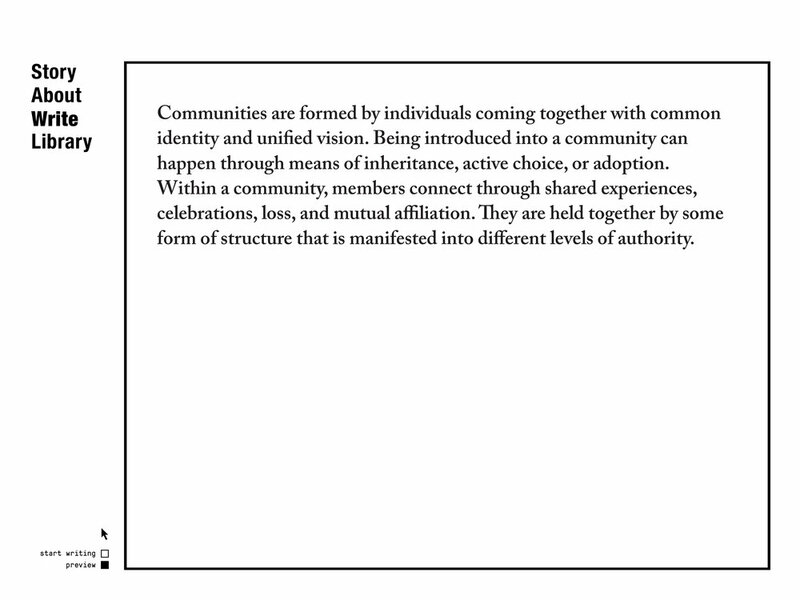 Using the 9 community constants as a framework that contains 9 sections, users can use this platform as a tool to write their own manifesto for the unique communities they are part of. The summarized explanation of each community constant are pre-written for each section, as a guide to help users kickstart their writing. They can tailor the writing to the specific expression/manifestations of the 9 community constants in their own experience of the community. Users can track how many of the 9 sections they have completed for their manifesto. Users can preview what they have written so far, with all 9 sections combined, so their manifestos flow cohesively from one section to another. Finally, this is where all the users who have benefited from using this interactive tool for structuring their own community, can contribute and share their writing to this online library. The library is supposed to also be a resource where users can reference and leverage the ideas of others to build on their own.